The dark brown leather Tri-fold Medical Wallet is hand crafted for us only. 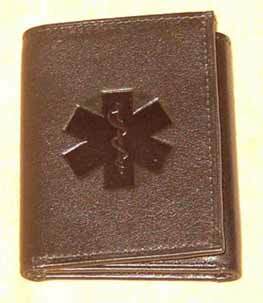 This Tri-fold Medical Wallet is made from genuine leather in dark brown and black colors. We had the Medical symbol debossed natural outside. 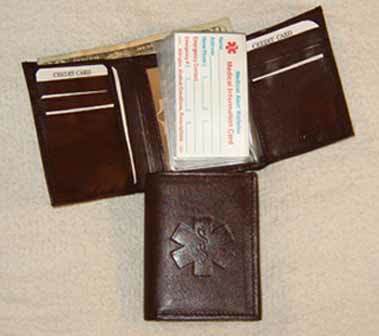 Inside this Tri-fold leather Medical Wallet are 6 clear credit card slots, 6 leather slots, 2 pockets one under the left and right leather slots, 1 clear window in the center, 2 full length currency holders one with a suede backing, 1 hide a key holder and a Medical Information Card, you fill out. 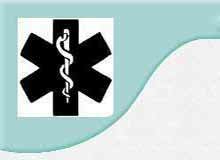 If you have any allergies, medical conditions and take medicains, then you should have a Medical symbol on you somewhere in case of an emergency or not, you'll be ready. "Fee Safe and Secure with Medical Wallets"